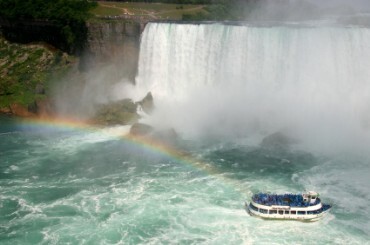 Can boats go near the waterfalls? Only special boats can go near them. Look! There is a rainbow above the water. 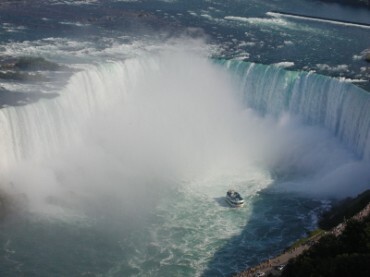 They feel excited because they are entering Horseshoe Falls. 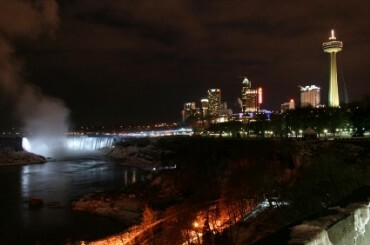 Can you see Niagara Falls at night? Lights shine on the waterfalls at night. Niagara Falls is romantic at night. Copyrights to the pictures and photos on this ESL/EL Civics website belong to individual photographers. We have purchased the rights to use them. Do not copy the pictures/photos on this site. Permission is granted to copy any of the worksheets for classroom use. Permission is granted to link to any page of this website. Contact Christina Niven, Web Developer, at christina@elcivics.com. Please send corrections, comments, greetings, and requests for new photo tours, lessons, and civics units. Copyright © Christina Niven, 2007.